The 1/10 ounce Krugerrand is the smallest standard denomination of the South African bullion coin, the others being the 1/4 oz, 1/2 oz and 1 oz. The gold bullion coin that started it all, by 1980 (13 years after its introduction) the Krugerrand made up more than 90% of the gold coin market, inspiring other government mints to release their own. These included the Canadian Maple Leaf, Australian Kangaroo, British Britannia, American Gold Eagle and Chinese Panda in the late 1970’s and 1980’s. The 1/10 ounce Krugerrand has a purity of 22 carats, with a minimum gross weight of 3.412g. It has a diameter of 16.55mm and the coin’s thickness measures 1.35mm. The edge of the coin, like all Krugerrands, is reeded. The 1/10 ounce Krugerrand was first released in 1980, and its design has not changed much since. 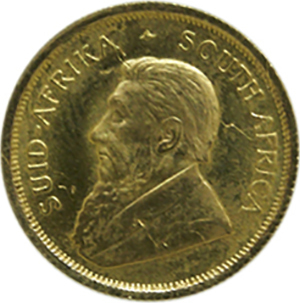 The coin’s obverse depicts the figurehead of Paul Kruger, the former Prime Minister of whom the coin is named after. Designed by Otto Schulz in 1984, the portrait has remained unchanged in 33 years since. 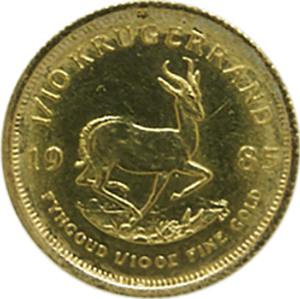 The coin’s inverse was also designed in 1984, this time by the engraver Coert Steynberg, and shows the iconic springbok (a South African antelope), with the word Krugerrand above and date of minting either side. There have been more than 50 million Krugerrand’s sold since its introduction in 1967 and it remains one of the most popular to this day, despite the increase in competition from other government mints. Due to this popularity, there have been many forgeries, or copycat designs from private mints, flooding the market. For this reason, purchasing Krugerrands, or any gold bullion coin, should be done from a reputable source. Goldinvetsments.co.uk is one of the oldest vendors in the UK and we are happy to dispense expert advice from our office in London.